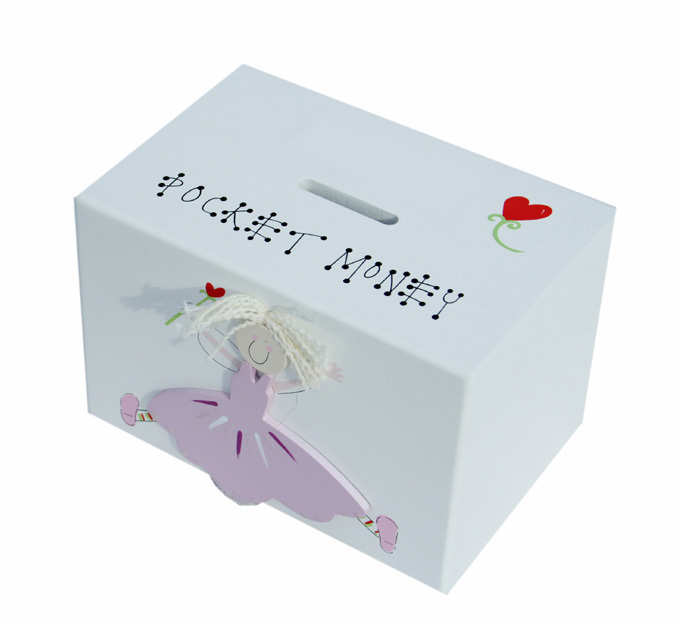 This wooden pink fairy money box is a fun and stylish gift that will encourage children to save. It comes with a standard message on top Pocket Money and features 3D details. Money can be retrieved from the back, where a wooden shape covers the hole and slides across. It includes personalisation of one name, which will be engraved on a plaque and attached to the box. If no personalisation required please type none in the personalisation box. Made from: This product is painted with non-toxic paints. The different types of wood are only sourced from countries where there are strict regulations regarding sustainability.All materials used are carefully sourced from around the world and the environment is always the main consideration when making decisions. All items are delivered via DPD courier. Non personalised boxes take 3-4 working days. Personalised boxes take 7-10 days or less.